Hyundai Motor India is preparing for some exciting launches for next-year, after the recent launch of new-gen Verna Sedan here in India. Upcoming launches include a compact SUV, and a small hatchback. 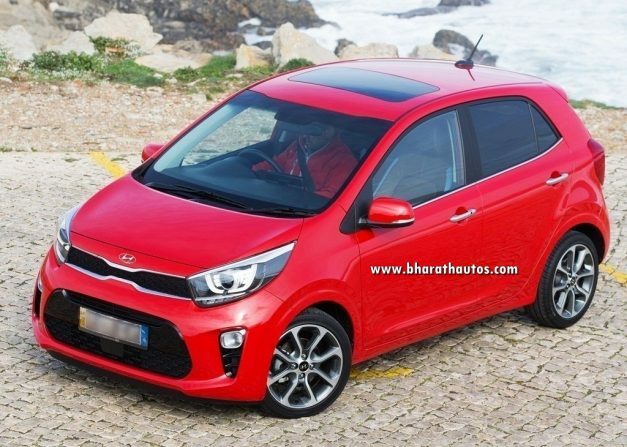 The hatchback will fill the gap between the Eon and Grand i10 and won’t be named the ‘Santro’, as said earlier. Picture of 2018 Kia Picanto with Hyundai-badging is just used for representational only, the actual model may differ from the one shown here. There were reports that the company would bring back the Santro brand to India. But the automaker recently confirmed that they will not name the car ‘Santro’ due to the current market conditions. Hyundai is expected to price the car well in-order to account for sales. Code-named as ‘AH’, the upcoming car will get a 1.2-litre petrol engine and a 1.1-litre iRDE engine mated to a 5-speed gearbox. AMT is also on the cards,and will be the first of the Hyundai cars here to employ the automaker’s AMT technology. This Hyundai small car will be dimensionally larger and wider than the Santro sold here in the past. This car is expected to be to be priced at around Rs. 4-6 lakh, and launch is scheduled by the second-half of 2018. After launch, the compact car will rival head-on with the Maruti Celerio and Tata Tiago. Hyundai will have high-hopes on this car and will be designed on an all-new platform seen on Kia cars today.